About JDMC – Jesenia De Moya C.
Photo Credit: Jessica Griffin. July, 2018. Jesenia De Moya Correa is a Dominican American award-winning journalist, specialized in multimedia reporting and content production on science, health and environmental issues for Latino Caribbean communities. She completed a Bachelor’s degree program in Media & Communications Studies with a minor in Corporate Communications at Pontificia Universidad Católica Madre y Maestra (PUCMM) in Dominican Republic, where she worked as the Editor-in-Chief for the online daily Aecsocial.org, as a producer and host for PUCMM’s online radio station Arroba101.net, as the line producer for the 2013 “Semana Más Corta” film festival and as the leading manager for the rebranding of the Students Association for Media & Communications (AECS, in Spanish). She received the Orgullo COM honor in June of 2013, granted by the Media & Communications Department of PUCMM’s Santiago Campus, because of the values, entrepreneur character and leadership spirit with which she envisioned her career meanwhile at the academia. In the Dominican media industry, Jesenia obtained one of three internship positions granted to outstanding journalism students nationwide. She became a “Journalist for a Year” in 2012 for newspaper Listín Diario, the oldest published media outlet in the country. During this internship, besides publishing general assignment articles that had regional and national impact, she was distinguished with the 2013 National Journalism Award in the Sustainable Tourism category, together with senior reporter Grisbel Medina Rodríguez. 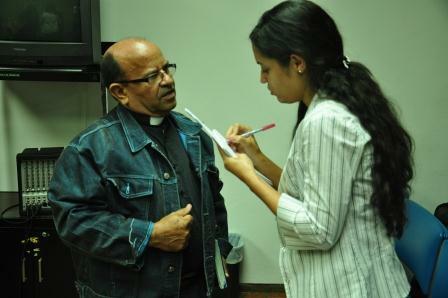 Speaking with Father Fabio in Santiago, Dominican Republic. June, 2013. Once graduated, she worked for Estudio 97.9 FM. Jesenia was a reporter, anchor and news producer for the 2-hour newscast “Meridiano 97”, for which she also coordinated special events programming and live broadcast. She started her social environmental service as one of the founding members of Blue Water Society. And then returned to her birthplace, New York City, in 2015, where she collaborated as the Social Media Coordinator and Line Producer for the webseries El Alto, a project on Dominican Diaspora culture in Northern Manhattan. Jesenia earned a pioneer Master’s degree in Journalism with a minor in Spanish-Language Reporting at the CUNY Graduate School of Journalism. There, she was one of 10 Graduate Student Council members and the representative for the J-School among all 24 CUNY system campuses, as its senator for the University Student Senate. In May of 2017, she was honored with the CUNY Excellence in Leadership Award. And during the same year, she worked as a Bridge Intern for Voice of America‘s Latin America Division, as a Digital News Intern for El Diario NY and was selected as a Student Finalist for the 2017 Eppy Awards, in the category Best College/University News or Event Feature, together with Spanish bilingual reporters Lidia Hernández Tapia and Estefanía Hernández. In early 2018, she was nominated to the Sidney Hillman Social Justice Reporting Prize by the CUNY J School, and ended as a semi-finalist. In April, she was -again- selected as a student finalist for the 2018 Mark of Excellence Awards with the Society of Professional Journalists, in the category Online Feature Reporting, for the profile on a clergy’s outstanding efforts to protect immigrants from deportation. In May, she became one of the 14 journalists to participate in the 2018 New Economies Reporting Project with The Media Consortium, as a Climate Solutions Reporting Fellow. 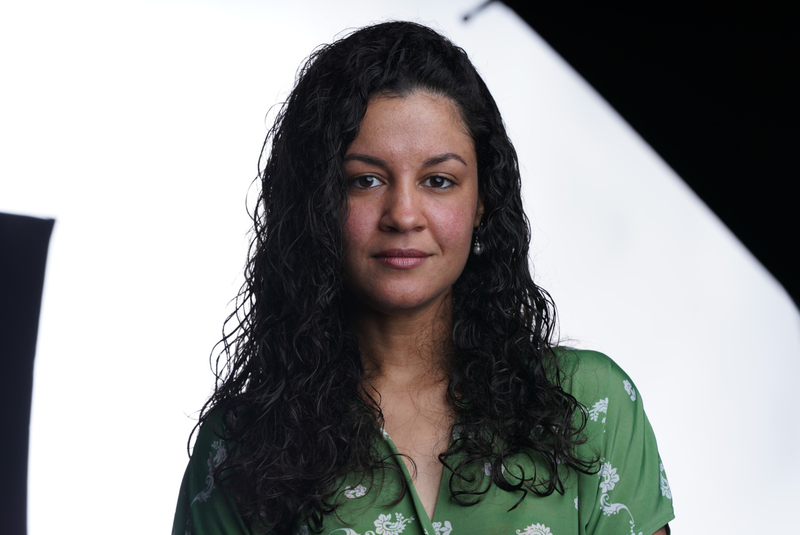 Jesenia is now one of six journalists to inaugurate the Lenfest Journalism Fellowship program with The Inquirer in Philadelphia, Pennsylvania, to work with editor Cathy Rubin as the Latino Communities Reporter on the News Features Desk, mentored by Accountability Reporter Claudia Vargas.